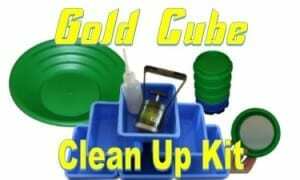 To train you gold cube there are 4 things that you need to do before you unleash you Gold Cube into the wild. Check your pump connections on the battery. The Brown wire goes to the positive (red) post. Remove all the bubbles from the vortex matting, either by scrubbing or spraying water into the matting. Running black sand is much heavier than regular sand, feed the slick plate accordingly; the more black sand the slower you go. Safety is always a concern when you are close to water. Creeks are dynamic bodies of water that can change anytime during the day or night. If it’s raining up stream a small creek can become a raging river in very little time. Even if it’s not raining, the water can still become so high that you may not be able to get back across a stream. Always take the proper gear and plan ahead for what nature will send your way. Drink plenty of water and apply sunscreen as needed. Pace yourself and remember you are going to have to pack out almost all the time going uphill. 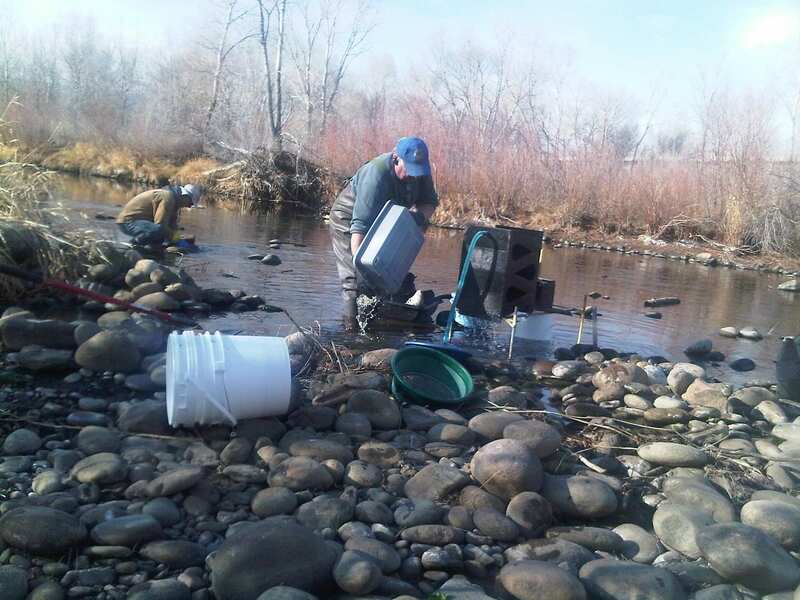 Living in Colorado, the winter months are a great time prospect because the water is generally low however the cold can make a great day into a very bad one if you happen to get wet. One technique we have tried that works quite well is to wear waders and long johns, process your material into buckets while in the water which can only take a couple of hours, then get out and warm up and process the material in the buckets through the cube. This method allows you to enjoy the day dry and warm. The newest addition to the Banjo Pan line up! 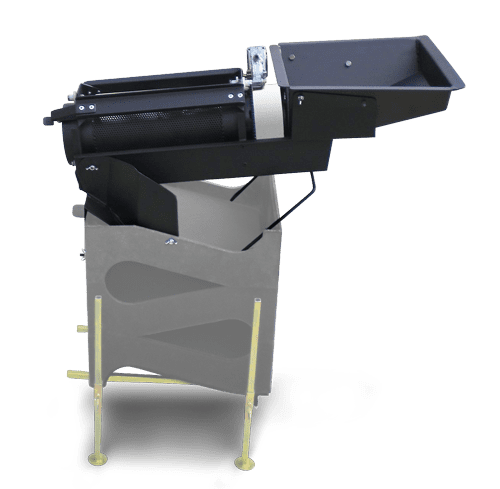 The Banjo Pan is the Worlds Fastest Gold Pan using the Gold Cube principles (degrees of separation) we’ve come up with a pan that combines a sluice and a gold pan for continuous production with a removable vortex collection mat. 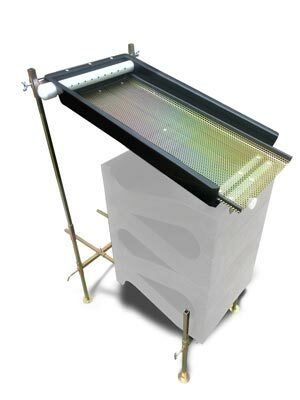 Not only continuous panning without stopping (similar to a sluice box) but performs wet, dry or underwater! Simply scoop your material into the Banjo Pan and dip it into the stream using a rocker motion to gradually flow the material over the mat. The Banjo Pan is designed to automatically provide the correct angle for the mat to work properly. When done processing carefully remove the mat and clean-out into the pan! Directions are on the back of the pan. The New Gold Cube Trommel has the spray bar mounted on the outside of the machine. A dependable machine that can outlast you (bring friends)! Just try to wear out our trommel and reap the rewards. 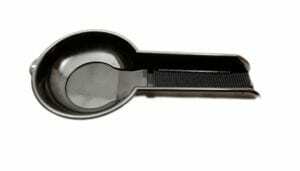 • New design brings the spray bar to the outside of the barrel. • Strong 12 volt motor designed for continuous use. • Built in slick plate and nugget traps. A Single tray can be used to upgrade or even add an additional to a 4 stack. For a continuous process it’s nice to have one to rotate! This very affordable kit contains all the gear you need to clean up you super concentrates. Don’t know how to do this? Visit our Video Page and check it out. Mike and Red have instructional and entertaining videos. 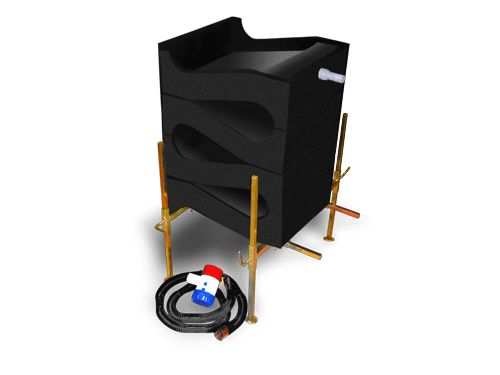 Connect multiple tubs for continuous circulation. The Vegetation kit’s PVC pipe slips into the Flanges to create a water tight seal between the tubs. 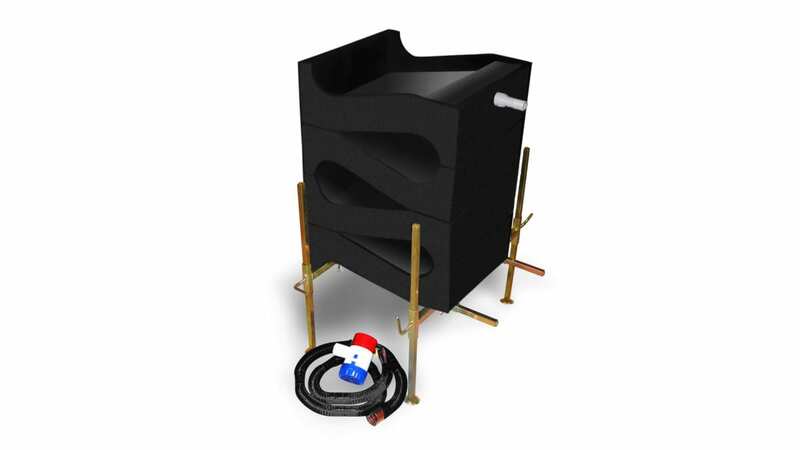 The system leaves the tubs totally portable and nest-able. The Flange system is a must where gold is fine, water is scarce, and every drop counts! An ideal portable and contained small production system has a 3 tub sediment system (3 Tub Kit) using the tube flange to connect them together. A very good system has a smaller tub inside a larger tub then one next to it connected by flanges (2 Tub Kit). 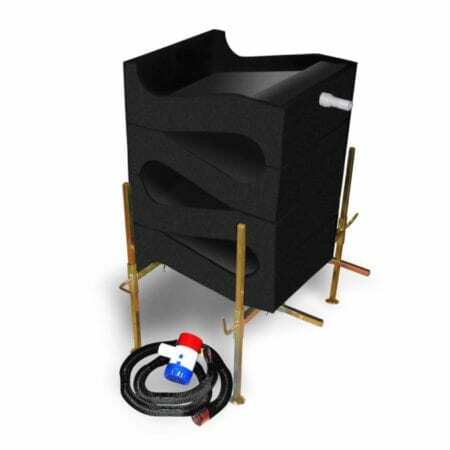 For more information on this incredible product please check the Tub Flange Page. 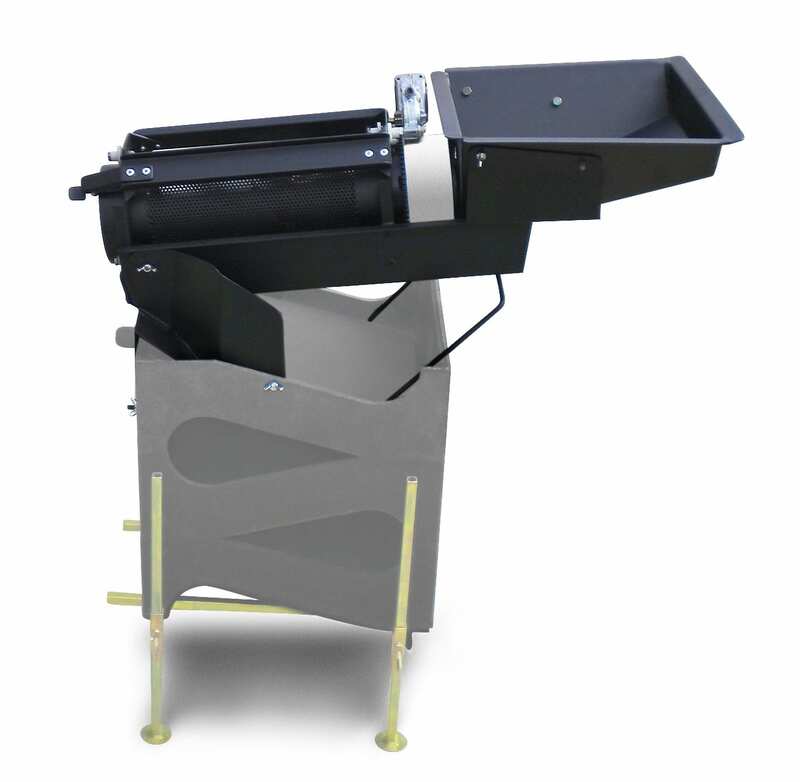 The 1100 pump (1100 GPH) is specifically selected for the Gold Cube. 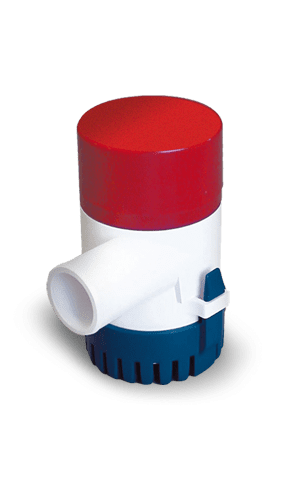 This bilge pump is well built with a stainless steel shaft and used with the 3 foot hose provided. Our 12 volt 2000 pump can add up to 12 feet of extension to the Cube. 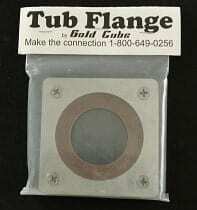 Tub Flange-Go Where No Prospector’s Gone Before!